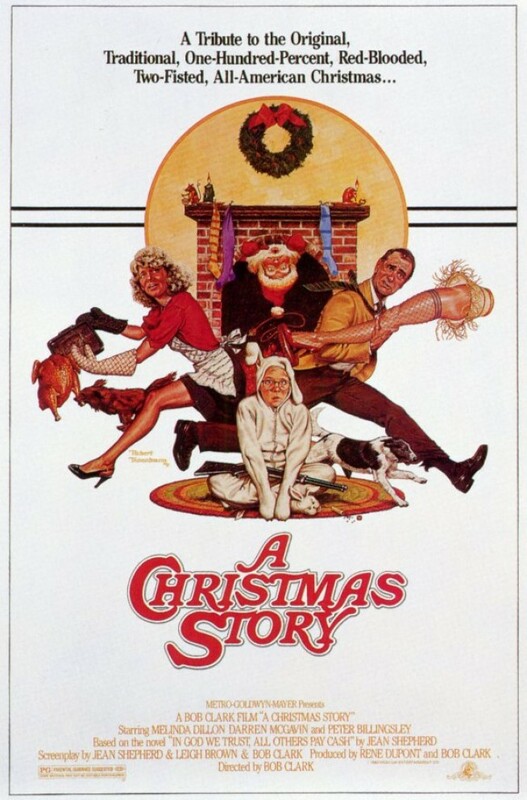 A Christmas Story is by far my favorite Christmas movie, in large part because it isn’t overly sappy or sentimental like most films in the genre. Yeah yeah, I know the holidays are supposed to make you feel warm inside and inspire goodwill toward men… but I kind of like that this movie acknowledges that life goes on, even in December. The holidays aren’t always perfect. Sometimes the furnace breaks, or you get in a fight, or the turkey dinner is ruined. The world doesn’t magically become perfect just because Christmas is coming. I realize that A Christmas Story is a polarizing film. For everyone I know who loves it, I meet someone who either hates or just doesn’t get it. Ben falls into the latter category. He has said that he doesn’t think this movie is funny, and he doesn’t understand why anyone would want to watch it repeatedly over a 24 hour period. OK, that’s his opinion. It won’t stop me from watching this every year, not-so-secretly hoping that this year he’ll get it. That would be be best present I could ever receive or would receive… or pretty close. I don’t understand this film’s appeal. I never grew up watching it so there is no nostalgic value in a A Christmas Story for me. There are some funny moments, but it really doesn’t grab me like some of the other Christmas movies that I love like Elf or Home Alone. A Christmas Story is a tale of Ralphie (Peter Billingsley), a young boy living in Cleveland. For Christmas Ralph wants nothing except a bee bee gun. Despite the fact all of the grown ups in his life claim he will shoot his eye out, Ralph can’t think of anything he’d rather open on Christmas Day. Will his parents give in and let Ralphie live out his dreams as a cowboy in the Old West? I don’t hate this movie, but I don’t love it either, like my wife does. She always talks about watching this film over and over on Christmas Eve. I can’t think of anything worse than watching this film for 24 hours straight. Not when there are so many other awesome Christmas films to watch. I like diversity in my holiday films, and I don’t like the idea of watching the same one over and over. Like I said, I never grew up with this film so it doesn’t have the same appeal it does to Sally, who grew up watching it every Christmas and loves it. I understand that. I have a soft spot for the He-Man Christmas special because I watched it every year when I was young. If I watched it again there would definitely be nostalgia overload. I remember we had a video (yes, a VHS) that had the He-Man special, Cabbage Patch Kids and Punky Brewster Christmas episodes on it. When December would roll around, this video would get played over and over, and I loved it. Even the lame Cabbage Patch Kids. So I understand why A Christmas Story would have an appeal to someone who grew up watching it. That’s not to say that A Christmas Story isn’t fun. There are some funny moments. The scene where a young boy gets triple dog dared to put his tongue on a frozen metal pole, only to have it get stuck there is certainly one of the film’s laugh out loud moments. Seeing Ralphie imagine himself as a cowboy defending his home from robbers is also funny, as is the fact he does hurt himself after receiving the toy gun, just like every adult said he would. A Christmas Story is not my favourite Christmas film, but I can understand how it would have appeal to kids who grew up watching it.